Flash! Friday # 37 — WINNERS! You people are HILARIOUS. Loved, loved your stories, even though some of you insisted on eating the baby despite my admonishment to eat before writing. I hope you take your stories and share them on your own blogs with your fans and followers, as they represented some truly delightful reading. Thank you so much for coming and cracking us all up this week. We’ll see you again Friday! Don’t forget all stories remain eligible for further hilarity on by Monday’s Flash Points feature, right here most Mondays. Judge Maggie Duncan says, Like Beth said last week, I’d also like to assure everyone that I’ve always done blind judging. I, too, copy and paste the entries (without author ID) into a Word document. I give the entire document a brief read-through, then I go back and deal with each story individually, using the criteria outlined on my Judge’s Page: use of the prompt, grammar and punctuation, usage and style, and story structure (and the latter includes coming up with a title for your opus). Each time, I don’t know whom the winner is until after I tally up the score for each story and go back to the Flash! Friday page to ID the winner, runners-up, and honorable mentions for an email to Rebekah. Margaret Locke, Untitled. This could have been aptly titled “Billy Goat Gruff,” and the story spelled out the goat’s grievances and his ultimate revenge in a way which made the goat’s action totally believable–and understandable. MT Decker, “Caprinae Diem.” This one literally made me LOL. Great use of malapropisms as puns. Whitney Healy, “Baby Talk.” Realistic inner dialogue between the baby and the goat–so that’s the reason I can’t get my grandkids to smile in pictures anymore! for “Glenn.” Two babies meet untimely and grotesque ends in this powerful story. Normally, I don’t like anthropomorphizing animals, but in this case it worked–perfectly. Underlying the many themes layered in this short, anguished story is an animal’s love of a sweet, innocent child and the appropriateness of the goat’s revenge. A nice gift all wrapped up in a Cormac McCarthy-type package. Well done. Congratulations, Sarah! 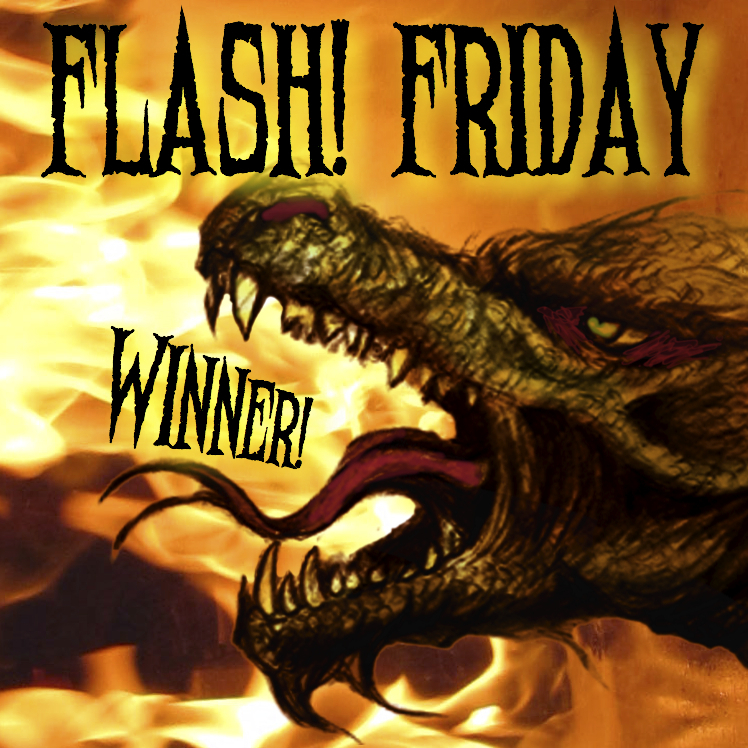 Here’s your spiffed-up Winner’s Page, a familiar yet still impressive dragon eBadge (below), and your winning Tale. Watch your inbox for a new interview for Wednesday’s Sixty Seconds feature. That’s our Glenn. He was a sturdy nipper. Big for his age and such a good lad. Never one for crying and complaining. Good as gold he was, and so handsome and strong. He looked just like his Pa. Course them farmers never cared. That winter when the snows came and food ran low, they carved him up and ate him as if he didn’t have a family what loved him. But that’s okay. Come spring I chewed a hole in the fence, and their little one crawled right through it down to the river. Funny. His name was Glenn too. Thanks so much! There were so many wonderful entries. It’s an honor to have won.